Ideal for all warehouse and commercial storage, pallet and cantilever racking provide highly flexible solutions, whether utilised in a cold store or factory environment. As a Dexion-accredited company, Stodec are able to offer customers nationwide the highest quality products at competitive rates. 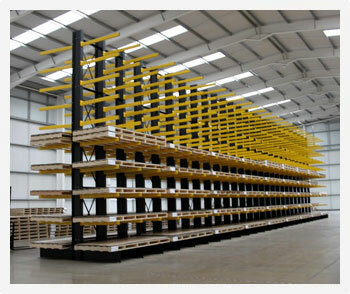 Our facilities are fully stocked with a wide range of racking solutions, including Dexion Speedlock MK3 and P90 pallet racking, cantilever racking for storing pipes and other long items, mobile pallet racking and a selection of accessories, all available for delivery and installation by our experienced team. Stodec Products take care of your racking needs from design through to fitting, so don’t hesitate to get in touch today for more information. The “Downloads” section shows full details of the cantilever and pallet rack product ranges. Loads can vary from light duty to many tons and there is a very wide range of rack sizes to suit most products. Galvanised units combining a roof section are possible for outside applications. See the pallet racking “Downloads” section for applications from standard warehouse racks to mobile, pushback, live storage, shuttles and drive-in systems. We will be pleased to advise on the most effective and economic design for your requirement.